Easter Island, known in the native language as "Rapa Nui" ("Big Rapa") or "Isla de Pascua" in Spanish, is an island in the south Pacific Ocean belonging to Chile. Easter Island is of considerable archaeological importance because it is the richest site of Pacific island carved stone monuments known as moai and has the only evidence of a form of writing in Polynesia. The pre-Christian people who carved the stone megaliths on the island devastated the environment, and cannibalism, the slave trade, and European diseases decimated the population. Efforts are being made to restore the natural environment by reintroducing native trees, and the native Rapanui people are turning back to their pre-Christian culture. 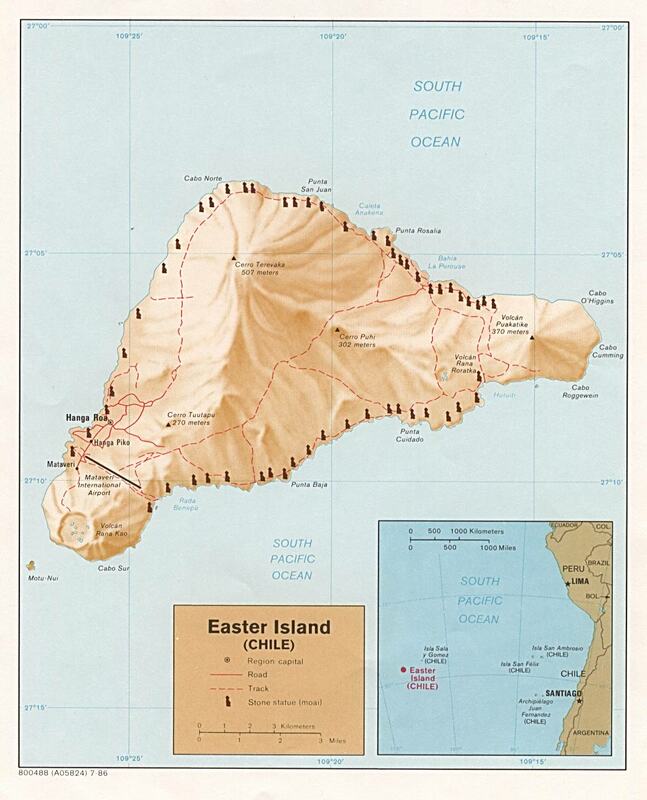 Located 2237 miles (3600 kilometers) west of continental Chile and 1290 miles (2075km) east of Pitcairn Island, Easter Island is one of the most isolated inhabited islands in the world. It is located at 27.09 South latitude and 109.27 West longitude. Its latitude is close to that of the Chilean city of Caldera, north of Santiago, Chile. 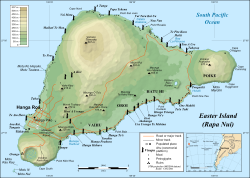 The island is approximately triangular in shape, with an area of 63 square miles (163.6 square kilometers), and a population of 3,791 (2002 census), 3,304 of which live in the capital of Hanga Roa. Easter Island is made up of three extinct volcanoes: Poike, Rano Kau and Terevaka. Easter Island enjoys a warm throughout the year and swept by strong trade winds. The average annual temperature is 68 F (20 C), with a range of 59 F to 80 F (15 C to 27 C). February is typically the hottest month. Rainfall is steady throughout the year, with an annual average of about 49 inches (1250 mm). May tends to be the wettest month; September has the least rainfall. Its closest neighbor, the tiny island of Isla Sala y Gómez, 250 miles (400km) further east, are recognized as a distinct ecoregion, called the Rapa Nui subtropical broadleaf forests. The island today is covered almost entirely in grassland. However, studies of fossil pollen and tree molds left in lava flows indicate that the island was formerly forested, with a variety of trees, shrubs, ferns, and grasses comprising the original moist broadleaf. A large Arecaceae palm, related to the Chilean wine palm "Jubaea chilensis" was one of the dominant trees, as was the toromiro tree ("Sophora toromiro"). The palm is now extinct; the toromiro is extinct in the wild, although a group of scientists are making efforts to reintroduce it. Reforestation projects include eucalyptus plantations at Vaitea and coconut groves in Anakena Bay. Before the arrival of humans, Easter Island also had vast seabird colonies, no longer found on the main island, and several species of land birds, which have become extinct. 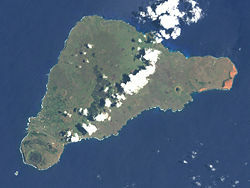 "Rapa Nui" is not the island's original name. It was coined by labor immigrants from Rapa Iti in the Bass Islands, who likened it to their home island. 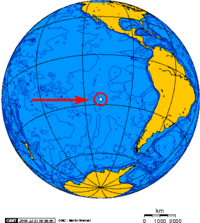 The Rapanui name for Rapa Nui was Te pito o te henua ("The Navel of the World") due to its isolation, but this too seems to have been derived from another location, possibly a Marquesan landmark. The name "Easter Island" stems from the first European contact with the island which began on Easter Sunday in 1722. Carbon dating indicates the first settlers arrived from other Polynesian islands, probably the Marquesas, around 1200 C.E. Their numbers grew quickly. These settlers brought bananas, taro, sweet potato, sugarcane, and paper mulberry, as well as chickens and rats. Easter Island’s distinctive stone megaliths, or moai, were probably carved in a period from the thirteenth century C.E. to the seventeenth century, at a time when the island was largely planted with trees and resources were plentiful. Some scholars argue that the population may have reached 15,000 during the height of the moai-building period; more recent analysis suggests the human population probably reached a maximum of about 3,000, perhaps slightly higher, around 1350 C.E. and remained fairly stable until the arrival of Europeans. If the human population had been any larger, the rat population would have exploded even more quickly. The combination of humans cutting down palm trees and rats eating the palm seeds led to rapid deforestation. Midden (refuse heap or latrine) contents show a sudden drop in quantities of fish and bird bones as the islanders lost the means to construct fishing vessels and the birds lost nesting sites. A powerful warrior class, or matato’a emerged as the mana of the great chiefs declined. Around 1680, a coup by matato’a brought a new cult based around a god Makemake. In the cult of the birdman (tangata manu), a competition was established in which every year a representative of each clan would dive into the sea and swim across to Motu Nui, a nearby islet, to search for the season's first egg laid by a "manutara" (sooty tern). The first swimmer to return with an egg would be named "Birdman of the year" and secure control over distribution of the island's resources for his clan for the year. The tradition was still in existence at the time of first contact by Europeans but ended in 1867. European contact with the island began in 1722, on Easter Sunday, when Dutch navigator Jacob Roggeveen encountered 2,000 to 3,000 inhabitants on the island. He reported that Easter Island was exceptionally fertile, producing large quantities of bananas, potatoes, and thick sugarcane. Most of the iconic statues of Easter Island were still standing when Roggeveen arrived. Spanish captain Don Felipe Gonzáles claimed the island for the King of Spain in 1770, but no ship from the Spanish navy ever came to make it official. The famed English explorer Captain James Cook stopped briefly in 1774, and a French admiral and explorer, Comte de La Pérouse, spent 11 hours on the island in 1786. A bay on the north coast has been named after him. The behavior of visiting European sailors was unpredictable. Excitable islanders were shot at. In the 1800s, whalers looking for water and women, brought diseases, principally venereal diseases. In 1805, the captain of an American ship, the USS Nancy, kidnapped 22 men and women, intending them as laborers to work at a seal colony. The men escaped by jumping overboard. Unable to recapture them, the crew shot at them killing all but one, who survived the swim and returned to Easter Island. 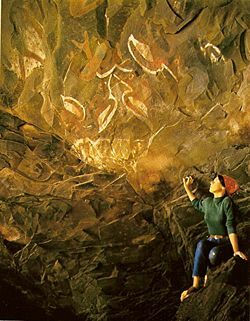 Paintings in the so-called "Cave of the Men Eatresses". Eight Peruvian slave ships arrived at Easter Island in December 1862, and kidnapped 1407 Rapanui people, about one-third of the estimated population. Some were sold in Peru as domestic servants, others were sold for manual labor on the plantations. A public outcry prompted the Peruvian government to ban such Polynesian “imports.” The slavers shipped smallpox-infected Rapanui back to Easter Island, causing an epidemic that all but wiped out the population, reducing it 110 Rapanui in 1877. In 1864, Eugene Eyraud, a lay member of the Sacred Heart Congregation, landed to set up a mission. But, in a short time, all his possessions were confiscated and he became a virtual captive. He was rescued nine months later. Eyraud returned in 1866 with Father Hippolyte Roussel. For the disheartened islanders, the food and medicines were incentives for religious conversion. Horses and wheelbarrows were also introduced by the missionaries. Two Chilean ships had visited the island beginning in 1837. At that time, Chile claimed the largest fleet in the Pacific Ocean. In 1888, a Chilean Captain, Policarpo Toro Hurtado, took formal possession of the island in the name of the Republic of Chile. Twelve Rapanui chiefs ceded sovereignty to Chile "forever." A French sea captain who brought the two French missionaries to the island, Jean-Baptiste Onéxime Dutrou-Bornier, returned in 1868 and gradually bought up land in exchange for trivial gifts. Dutrou-Bornier built an elaborate wooden house, proclaimed himself lord of the island, and took a Rapanui wife. He clashed with the missionaries over plans to ship Rapanui people to Tahiti. Buildings were burned and crops destroyed. The missionaries were recalled and the population declined further. At that stage, Easter Island was rented to a foreign-owned sheep company and was turned into a sheep ranch. As a result, until the 1960s, the surviving Rapanui descendants were forced to live away from their traditional land and instead in a confined settlement in squalid conditions at the outskirts of Hanga Roa. Moreover, extensive sheep farming throughout most of the twentieth century accelerated soil erosion. Since being allowed to live free, the Rapanui have re-embraced their ancient culture, or what could be reconstructed of it. A yearly cultural festival, the Tapati, celebrates native pastimes. Orthographic projection centered on Easter Island. Administratively, Easter Island is a province (containing a single municipality) of the Chilean Valparaíso region. It is governed by a mayor and six councillors. Easter Island has moved from a Polynesian economy, based on cultivating sweet potato, raising chickens, and coastal fishing, to a cash economy based on tourism. The opening of Mataveri International Airport near Hanga Roa brought increasing numbers of tourists since the 1960s. Tourists could stay in the few small hotels in the village area, or in homestays. There are twice-weekly flights from Santiago. A well-organized Chilean national park system provides guided tours and security for the monuments. 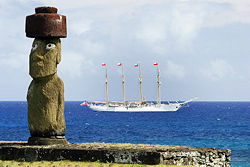 Tourism, though, and the influx of people from mainland Chile threatens to alter the Polynesian identity of the island. Since the 1980s, land disputes have created political tensions, with part of the native Rapanui opposed to private ownership of property and in favor of traditional communal property. The National Aeronautics and Space Administration lengthened the airport's single 9524 ft (2903 m) runway to create as an alternate emergency landing site for the NASA space shuttle. Twentieth century Norwegian anthropologist and explorer Thor Heyerdahl pointed out cultural similarities between Easter Island and South American Indian cultures. Scholars have long argued that Polynesian sailors may have reached the central-south coast of Chile. Some “Polynesian-like” cultural traits, including words like “toki,” have been described among the Mapuche people from southern Chile. However, present-day Polynesian archaeology refutes any non-Polynesian influence on the island's prehistory, and the discussion of the subject has become political. DNA testing has proved that the Polynesians arrived from the west rather than the east, and that the people of Easter Island are descendants of intrepid voyagers who set out from Taiwan thousands of years ago. Population at the 2002 census was 3791 inhabitants, up from 1936 inhabitants in 1982. The increase was due to the arrival of people of European descent from the mainland of Chile with the result that the island is losing its native Polynesian identity. In 1982, around 70 percent of the population were Rapanui (the native Polynesian inhabitants). At the 2002 census however, Rapanui were only 60 percent of the population of Easter Island. Chileans of European descent were 39 percent of the population, and the remaining one percent were Native American from mainland Chile. About 3304 of the 3791 inhabitants of the island live in the town of Hanga Roa. Rapanui have migrated out of the island. At the 2002 census there were 2269 Rapanui living on Easter Island, while 2378 Rapanui lived in the mainland of Chile (half of them in the metropolitan area of Santiago). Easter Island, or Rapa Nui, is famous for its massive stone sculptures known as "moai"
Population density is only about 60 inhabitants per square mile (23 per square kilometer). Disease due to contacts with Europeans, deportation of 2000 Rapanui to work as slaves in Peru, and the forced departure of the remaining Rapanui to Chile brought the population of Easter Island to the all time low of 111 inhabitants in 1877. Out of these 111 Rapanui, only 36 had descendants. The language belongs to the Austronesian family. The modern language, however, has been heavily influenced by Tahitian, so much so that the modern name of Easter Island, “Rapa Nui,” is Tahitian, and that the common greeting, “iorana” meaning "hello," is also Tahitian (“ia ora na”). As a territory of Chile, the main language spoken is the Chilean variant of Spanish. As a territory of Chile, Easter Island is predominantly Catholic with followers of some Protestant denominations. Pre-Christian Easter Island society was characteristically Polynesian in that power and “mana” (spiritual power) were focused in the “ariki mau,” or great chief. The position of ariki was hereditary, and was considered to be a direct descendant of the gods. Society was divided into “mata” (clans) associated with parts of the island and grouped into two divisions. Among the most recognized cultural artifacts in the world, the massive stone "heads" of Easter Island are remnants of a complex ancient civilization. The statues, known as "moai" actually are heads and complete torsos. Some upright moai, however, have become buried up to their necks by shifting soils. About 100 moai are still standing. They vary in height from 10 to 40 feet (three meters to 12 meters). An immense unfinished statue, 68 feet (21 meters) long, was found in a crater called Rano Raraku. 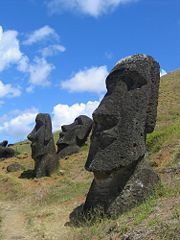 Carved from a soft volcanic rock called “tuff,” the moai consist of huge heads with elongated ears and noses. Many statues are on burial platforms and bear cylindrical, brimmed crowns of red tuff. The largest crown weighs about 27 tons. The moai were not carved by slaves or workers under duress, but by master craftsmen, formed into guilds, and highly honored for their skills. Experimental archaeology has demonstrated that some moai could have been placed on wooden frames and then pulled to their final destinations. Rapanui traditions metaphorically refer to spiritual power (mana) as the means by which the moai were "walked" from the quarry. A total of 887 moai have been inventoried on the island and in museum collections. The on-going moai survey continues to turn up new fragments, and mapping in Rano Raraku quarry has documented more unfinished statues. The largest structures are the great burial platforms, called “ahu,” (shrines) which supported rows of statues. The ahu were situated on bluffs and in areas commanding a view of the sea. Each ahu was constructed of neatly fitted stone blocks set without mortar. The burial platform supported four to six moai, although one ahu, known as Tongariki, carried 15 moai. Within many of the ahu, vaults house individual or group burials. The function of the moai was to stand on an ahu as representatives of sacred chiefs and gods. Ahu are similar to structures found in the Society Islands, in French Polynesia, where upright stone slabs stood for chiefs. When a chief died, his stone remained. The pre-Christian Easter Islanders had numerous superstitions and resorted to charms, prayers, incantations, and amulets to bring good luck and ward off evil. After death the soul was supposed to depart to the “place of departed spirits" to be rewarded by the gods or tormented by demons. A small hole was built in the top of all vaults for the spirit of the deceased to depart. Spirits were believed to be wandering the earth, influencing human affairs. Spirits were supposed to appear to sleeping persons and to communicate with them through visions or dreams. Gnomes, ghouls, and goblins were believed to inhabit inaccessible caves and niches in the rock and could prowling about after dark. The small wooden and stone "household gods," were made to represent certain spirits, and were regarded as the medium through which communications might be made with the spirits, but were never worshiped. The Great Spirit Meke-Meke is represented by a bird-like animal as referred to in the description of sculptured rocks and paintings at Orongo. Excavations have disclosed hidden caves containing decayed remains of tablets and wooden images, and numerous small wooden sculptures. The tablets are covered with finely carved and stylized figures, which seem to be a form of picture writing, known as Rongorongo. It has never been deciphered despite the work of generations of linguists. Some writers have asserted “rongorongo” means “peace-peace” and that the texts record peace treaty documents. There is archaeological evidence of intensive agriculture on Easter Island, including 1233 prehistoric stone chicken houses or “hare moa,” which are more conspicuous than the remains of the prehistoric human houses (which only had stone foundations). They were 20 or more feet long, and 10 feet wide, with a small entrance for the chickens connecting to a stone-walled yard. Cannibalism did not disappear from Easter Island until after the introduction of Christianity. Cannibal feasts were held in secluded spots, and women and children were rarely admitted. A liking for human flesh drove Easter Islanders' cannibalism, since humans were the only large mammal available. Women and children were the principal victims. Oral traditions show an obsession with cannibalism. ↑ Isla de Pascua - Easter Island - Rapa Nui Portal Rapa Nui. Retrieved January 19, 2012. ↑ Pending the enactment of a special charter, the island will continue to be governed as a province of the Valparaíso Region. ↑ Proyección National Statistics Office (INE). Retrieved January 19, 2012. Hunt, Terry, and Carl Lipo. Late Colonization of Easter Island Science 311(5767) (2006): 1603-1606. Retrieved May 31, 2008. Map of Easter Island from the Perry-Castañeda Library Map Collection. Easter's End by Jared Diamond. Eastern Island - Myth - story of HOTU MATUA. This page was last modified on 26 September 2017, at 15:13.